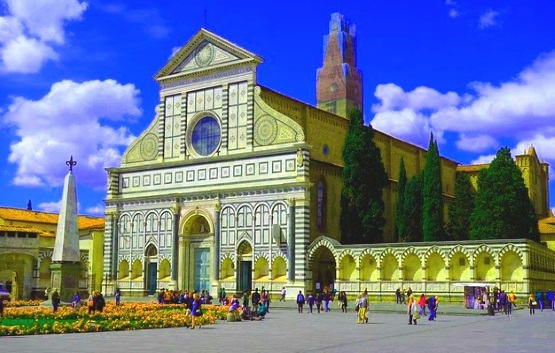 The Church of Santa Maria Novella is one of the largest churches in Florence and Italy. In Florence, of course, it is eclipsed by the gigantic cathedral of Florence, in almost every other city in the world such a church would be the most important church of the city. The Basilica of Santa Maria Novella is the only church in Florence with a Renaissance façade. The façade of the Cathedral and other churches was added much later. The interior of the huge basilica is typically Tuscan. Directly left of the church Santa Maria Novella is a monastery of the same name. Florence’s main railway station is also called Firenze Santa Maria Novella. It is located in the district of the same name just a stone’s throw from the Basilica. The church dates back to the 13th and 14th centuries, the beautiful façade of Santa Maria Novella in green and white marble is from the 15th century. Interesting on the façade are the clear geometric shapes, whether rectangles, triangles or curves such as arches and circles. 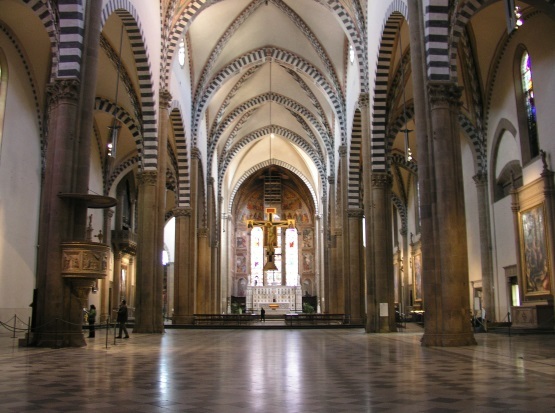 Inside the Basilica of Santa Maria Novella Florence, it is easy to see that it is an ancient Gothic building. 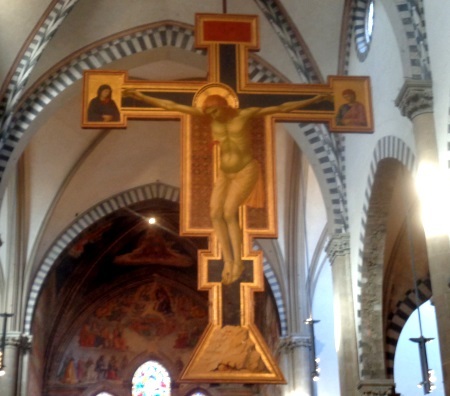 One of the most outstanding works of art in the church is undoubtedly the large wooden cross by Giotto (di Bondone) from the 13th century, which hangs in the middle of the church. At least as well known is a fresco by Masaccio called „Trinity“ from the year 1428 (see picture below). It is probably the first work of art in the world in which the laws of perspective were correctly used. It hangs from the entrance on the left long side of the large church. Also the famous painting „Rucellai Madonna“ by Duccio originally hung in the basilica in Florence. It is now in the Uffizi Art Museum, about a kilometer away. If you want to visit the church, go through the small open gate to the right of the Basilica of Santa Maria Novella Florence. After about 50 metres you will come to a box office. We were there on a weekday in February and didn’t have to wait long. But one sees how the queues are already divided 50 metres before the cash desk into visitors who have bought a ticket in the internet and visitors without tickets for the church. The queues in the season are often very long. Online tickets are more expensive, but they include an audio guide. After the entrance control you enter the church through a side entrance. First you have to look at the main building of the church. Then we continue to several smaller chapels in the Basilica of Santa Maria Novella Firenze. Here, too, there are great works of art on the walls. In a small chapel there is a shop with books and souvenirs. A door leads to the convent of Santa Maria Novella, a Dominican monastery. 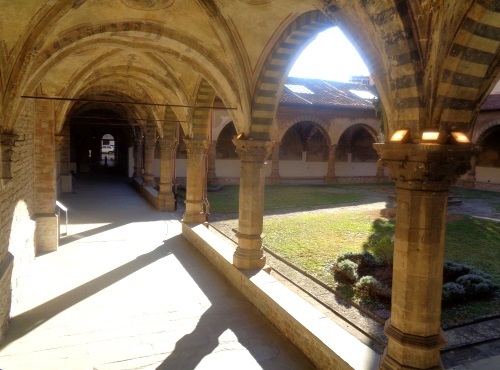 First you come to the famous Green Cloister (chiostro verde). You can see some rooms in the monastery. In some is the Museum of Monastery and Church Santa Maria Novella Florence. Further back you come to a much larger cloister. You can walk around both cloisters. The big one is about the size of a football field. Also in the cloisters are world famous works of art. Some are renovated, some have hardly any colour left. Through an exit, one leaves the church and the monastery in Florence. One comes out to the left of the basilica in Florence, the entrance was to the right of the basilica. The entrance fee at the beginning of 2019 is 7,50 Euro for adults. Children from 11 years pay 5 Euro, children under 11 years can visit the church without paying entrance fee. Since the queues can be very long, there is a separate entrance almost without waiting time. Here everyone can enter who has bought tickets on the internet before before. With tickets from the Internet an audio guide is usually included. We consider an audio guide to be very useful in the large complex with many works of art. In winter (October to March) the Basilica is not open on weekends, during the week from 9 to 19 o’clock, on Friday from 11 o’clock. In summer (April to September) the church is open every day of the week from 9 a.m. to 5:30 p.m. (weekend) or 6 p.m. (weekdays) with two exceptions: Friday again he from 11 o’clock and on Sunday and holiday because of the mass only from 13 o’clock. In July and August is on weekends in the evening one hour longer on (until 6:30 p.m.). Also interesting: The Basilica Santa Maria Novella is the great church and monastery of the Dominicans in Florence. The large Franciscan church is the Basilica of Santa Croce Florence, also worth seeing in the old town. Here, for example, Galileo Galilei and Michelangelo are buried.